The new crash barrier right next to the fast lane south of Albany. 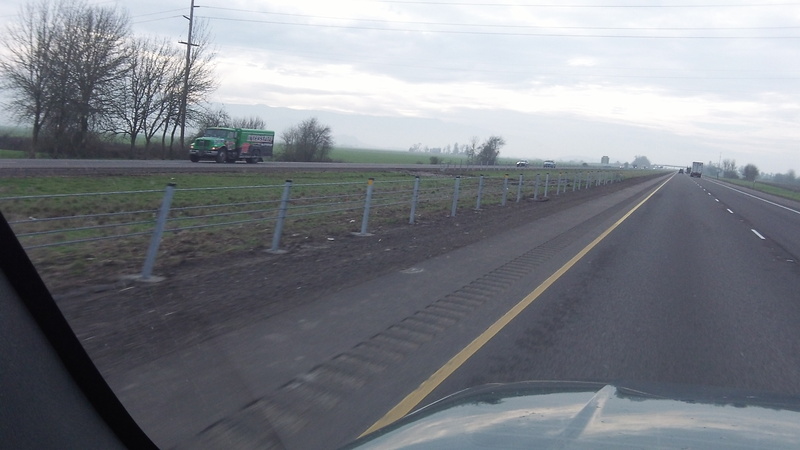 Why is ODOT placing the new median cable barrier on I-5 so close to the fast lanes in both directions, south and north? Thanks to Rick Little, the answer is at hand. I asked about this on Jan. 22, when I snapped the photo on my way south from Albany. The barrier seemed unusually close to the left-hand lane, not leaving a whole lot of space in case someone has car trouble and has to pull off the freeway on that side. Protected wetlands in the middle of the freeway? That tells you how far we have gone off the rails with state and federal laws intended to protect lands which water-dependent wildlife and plants need. For decades now, the laws have been extended to land that is dry except when it rains. And there’s no longer a connection with natural habitat. After all, who needs a gaggle of waterfowl in the middle of I-5? Little says a barrier close to the highway rather than in the middle of the median is still effective in preventing cross-over crashes, as ODOT learned with a barrier on US 26 in the Mt. Hood area. I always try to give lawmakers the benefit of the doubt and assume that no group of sane people start out to write a stupid law. But every time I see something like this come up, I start to doubt the logic of my own thoughts. Really? If that’s the case, why is the cable barrier located in the middle in numerous other medians where they have been installed for some time? I still suspect the current soft conditions played a big role in the decision to install it where it is, and that if the barrier were being installed during the dry months, it would be placed in the center, where it really belongs. Perhaps this is the price for rushing to get these barriers in place ASAP? Fine, but wetlands???? Only during half the year. That median is as hard (harder?) as a typical front lawn from July through September. I could not agree more. The state and ODOT has clearly forgotten the value of the K.I.S.S. method of doing things. Just keep it simple, including the explanations. Don’t try to impress us with “concern for the environment.” Just get it done……correctly…..the first time, please. The “excuse” for the placement is sillier than the placement. I would hope that I could, if going off the road to the left, have time to gain control of my vehicle before hitting the barrier. This placement leaves little chance of that. Also we will not be able to go very far to the left to avoid an accident. The interstate system was ike’s version of the obama stimulus program with the additional benefit of creating our once profitable suburban sprawl. And I have seen geese grazing in interstate medians. So maybe the question to ask is what is the cost benefit of doing the project as is vs mitigation vs putting the money into your favorite project. Of course what is a benefit is an issue. If it makes my life better then it is a benefit. You, not so much. And I tend to avoid i5 anyway. You do all appreciate that the wetlands were there before the freeway, right? So really, ODOT is getting all the benefits from destroying them (building freeways on either side) without any of the costs of mitigation for those acres upon acres of median. I appreciate that not everyone cares about wetlands or thinks mitigation is a good way to handle their loss, but really, if there’s anyone who should feel cheated by the policy that “if I don’t build directly on top of it I don’t have to replace it,” it’s the ducks. If the “WETLANDS” regulations had been in effect when I-5 was built, at least from Albany south to Eugene, it probably would have been placed on pillars. There is so much area that would have probably been classed as wetlands the construction would have been cost prohibitive or built with so many curves in it that the distance between the two locations would be much,. much more than it is. My father and I were farming on some of the area taken for the freeway and I am familiar with the soil conditions in the area. I think calling these ‘Wetlands” it a bit like closing the barn door after the livestock have left. Consider all the oil drippings and other chemicals that get washed into these “Wetlands”, are they really viable to fall under that classification. Maybe we should rename them “swales”? speaking of wetlands, there “used” to be one, full of wildlife, now under the pile of rock debris at LBCC, near the Luckiamute Bldg. They used it as a dumping ground for construction debris, it appears, and now it can’t breathe OR be parked on. If only those animals could vote . . . The “wetland” law is in effect because “the public” complained, A LOT, not because the government was bored. There is so much “red tape” they can’t even fill a pothole without a written up request as to why it needs to be done, unless it is an emergency &/or life threatening (deep ones could kill a motorcycle driver if hit just right). They would LOVE to put it in the middle or over to the side a little more. No matter what they do, someone is going to complain. Protect the wetlands, why is it so close to the lanes? Fill the pothole, why are you messing with traffic to fill a pothole? Kill the noxious weeds, don’t spray weed killer. I am going to buy this house right next to the freeway, the freeway is too loud you have to put up walls. They can only do so much, but no matter what they do someone WILL complain. So just know this… They aren’t doing something to just piss you off, they are doing it a certain way because the other way pissed off someone else. They look at ALL available options before doing something, they aren’t just winging it.